This game was played at Hampden Park due to ground improvements being made to Celtic Park. The old Hampden was still capable of holding 125,000 people and sadly on the night only 18,797 hardy souls turned out to watch. The reason for such a low turnout was due to the glamour fixtures against Rangers and Manchester United which Celtic were due to play within the next five days. 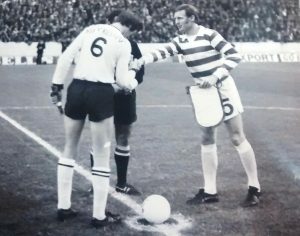 This was Celtic’s first tie against Norwegian opposition and Jock Stein professed to knowing nothing about the Rosenborg team who were all amateurs or part-timers. Celtic also had a long injury list with Jimmy Johnstone, Davie Hay, Tommy Callaghan, Denis Connaghan, Jim Brogan and Jimmy Quinn all on the treatment table. Tommy Callaghan made the game and was played out of position at left back. Norwegian goalkeeper Geir Karlsen, who later had trials with Celtic and then signed for Dunfermline, had a brilliant game but sadly broke an ankle on the night. Goals by Macari and Deans gave Celtic a 2-0 half time lead but the second half onslaught did not materialise and Rosenborg stunned the sparse home crowd when Wirkola scored a well taken goal on the break. The Celtic fans left somewhat disappointed at the end but they were in a happier mood at Hampden just three days later when the Celts destroyed Rangers 3-1 in one of the most one sided Glasgow derbies ever played. Celtic:- Williams, McGrain, Callaghan, Murdoch, McNeill, Connelly, Hood, Dalglish, Deans, Macari, Wilson (Lennox 45) Subs: Connaghan, McCluskey, Davidson. Rosenborg BK:-Karlsen (Torp), Wormdal, Rønnes, Rime, Meirik, Christiansen, Næss, Sunde, Lindseth, Wirkola, Ødegård (Hansen). After arriving in Trondheim Celtic were forced to train on a local park in the dark when the pitch at the Lerkendal stadium was unavailable because of almost continuous rain. The small band of Celtic fans were amazed at the fur clad local fans as the weather was distinctly colder in Norway than in autumnal Glasgow. Celtic played in change strip of green shirts, white shorts and green socks. They started poorly and the amateurs of Rosenberg were 1-0 up at half time and they were worth their lead with some fine play. This was a major concern as it put Rosenberg ahead on aggregate with their away goal. Jock Stein was said to have given his players a serious tongue lashing at half time and they responded in the second half. Celtic’s equaliser came from a scrappy 6 inch tap in by Macari. The Celts now found their form with Harry Hood combining well with Tommy Callaghan. Jimmy Johnstone now found his touch. With the defence now supporting the attack, Harry Hood got a second goal from a high cross from Billy McNeill. Celtic’s full time fitness had now kicked in and they clinched it in the last minute when Johnstone ran 50 yards in a superb run and set Kenny Dalglish up for a fine goal. This was Dalglish’s first ever goal in European football and it was not to be his last. This game was meant to have been played on 12th September 2001 and Celtic fans were looking forward to it tremendously as it would have been the Celts’ first ever Champions League game. However the events of ‘9-11′ in New York meant that UEFA had adjourned the game until October as a mark of respect to the victims of the disaster. Rosenborg were more experienced at Champions League level than Celtic and they had built a tremendous reputation as a side which was hard to beat – in previous years they had spectacularly beaten AC Milan, Real Madrid and Borussia Dortmund. The ex-Celtic striker, Harald, Brattbakk, returned in Rosenborg colours and this added a bit of spice to the tie. The 57,233 crowd inside Parkhead exploded in 21 minutes when Alan Thompson drilled in a low free kick trough the Norwegians’ wall. Celtic continued to press throughout with Didier Agathe having a fine match on the right flank. Chris Sutton and Henrik Larsson came close to extending their lead but Rosenborg’s defence was resolute. Late on Celtic became nervous but the Norwegians were unable to take advantage of this. At full time Celtic fans were delighted with this hard fought win against stiff opposition. Celtic: Douglas; Mjallby, Balde, Valgaeren; Agathe, Lambert, Lennon, Petrov, Thompson (Guppy, 65); Sutton, Larsson. Subs:- Kharine (gk), Sylla, McNamara, Hartson, Tébily, Moravcik. 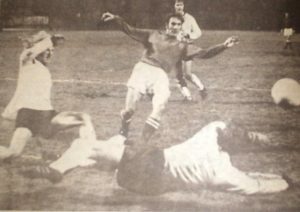 Rosenborg: Arason; Basma, Hoftun, Olsen (F Johnsen, 85), Saarinen; Berg, Skammelserud, Strand (Wisnes, 81); Brattbakk (George, 73), Rushfeldt, B Johnsen. Subs:- E Johnsen (gk), Stensaas, El-Fakiri. Celtic went into this game full of confidence but had a most difficult night in Trondheim. In their change colours of yellow and green, the Celts never really got started in the bitterly cold conditions in Norway. Celtic had actually started fairly well but Brattbakk’s terrific shot in 19 minutes badly set them back. There was something predictable about Harald scoring against his old team mates and when he made it 2-0 after 36 minutes Celtic looked down and out. It could have been 3-0 at half time had Rab Douglas not made a tremendous save from Skammelsrud’s penalty, after Brattbakk, who was now running riot, was fouled. Celtic rallied in the second half. Henrik Larsson hit the bar with a header and both he and Chris Sutton missed chances they would normally have executed. Martin O’Neill threw on Lubo Moravcik and John Hartson but to no avail and at the end Celtic could have no complaints. It was a sobering thought that better teams than Celtic had suffered in Rosenborg’s Lerkendal stadium. Rosenborg: Arason, Saarinen, Hoftun, Basma, Olsen, Strand, Berg (Winsnes 73), Skammelsrud, Rushfeldt, George (Johnson 83), Brattbakk Subs:- Espen Johnsen, Frode Johnsen, Knutsen, Blixt, Stensaas. Celtic: Douglas, Valgaeren, Balde, Mjallby, Thompson (Hartson 78), Petrov (Moravcik 67), Lambert, Lennon, Agathe, Larsson, Sutton Subs: Kharine, Sylla, McNamara, Tebily, Guppy. This was a nervy affair in which Celtic struggled to break through a well drilled Rosenborg defence. Celtic were missing first choice strikers, Moussa Dembele and Leigh Griffiths and carried little threat. In the second half the Norwegians looked the stronger side and missed three gilt edged chances. Celtic fans left Parkhead at time up knowing tat they had been let off and were now facing a difficult second leg in Trondheim. Celtic: Gordon Lustig Simunovic Ajer Tierney Ntcham Brown Forrest Sinclair Rogic Armstrong Subs: De Vries Bitton (s 25) Hayes (s 63′) Benyu (s 81′) McGregor Ralston Eboue. In the second leg Rosenborg looked unsure whether to defend or attack for the goal that would take them through. Celtic had defensive problems with Biton and Ajer ending up making a central defensive partnership but they coped well. Celtic grew in confidence when Leigh Griffiths appeared as a second half substitute and in 69 minutes James Forrest gave them the lead with a magnificent shot from a tight angle. Celtic could have scored again before full time through Griffiths and Forrest but that one vital goal was enough to see them through. Rosenborg Hansen, Hedenstadt, Bjordal, Skjelvik, Meling, Jensen, Konradsen, Midtsjoe, Jevtovic (Helland 73), Bendtner, De Lanlay (Vilhjalmsson 73). Subs Ostbo, Rasmussen, Rashani, Gersbach, Lundemo. Celtic Gordon, Lustig, Simunovic, Sviatchenko (Bitton 25), Tierney, McGregor, Brown, Armstrong (Rogic 71), Forrest, Hayes (Girffiths 58), Sinclair. Subs De Vries, Gamboa, Ntcham, Eboue.